The PMD 150/155 Master Message Display was designed to give you more display continuity and flexibility than ever before. This extraordinary low-cost unit is an intelligent, alphanumeric display panel, which is user programmed with individualized messages. Its compact size reduces space previously required for annunciator panels and indicator lights. Unlike annunciator panels, the PMD 150/155 can be used to provide complete information of machine or process status, operator prompting, and fault indicators. 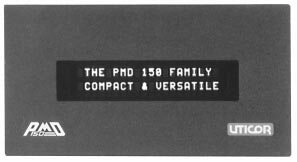 The PMD 150/155 Master Message Display comes with 2-line display with 20 vacuum fluorescent characters 0.2" (5.05 mm) high. Interfacing to this unit is not a problem either. The PMD 150/155 Master Message Display comes with drivers that enable it to interface directly with over 30 brands and/or models of PLCs. Messages are programmed into the Master using any ASCII terminal or PC with an RS-232C interface. Message programs can be stored on digital tape and reloaded into one or more message displays at any time. The PMD 150/155 can be interfaced to a printer, either to print the entire program or to print individual messages as they are selected. The PMD 155 is the same as a PMD 150, plus it features eight function keys and a numeric keypad. The keys provide contact closure and are completely isolated from thew internal electronics. The maximum voltage and current ratings for the contacts of each keypad are 30 VDC @ 30 mA. The keypads are terminated on a DB25 connector located on the circuit board on the back of the unit. The keypads provide contact closure for your automated process and you can define them any way you wish. The function keys have a changeable legend so you can customize the labeling of each function key.